While uniform design focuses on functionality, control, and tradition, fashion design promotes constant change, creativity, and subversion. Yet throughout history, fashion has drawn inspiration from uniforms of all kinds. This dialogue is the premises of Uniformity, an exhibition on display at the Museum at FIT unit the 19th November. 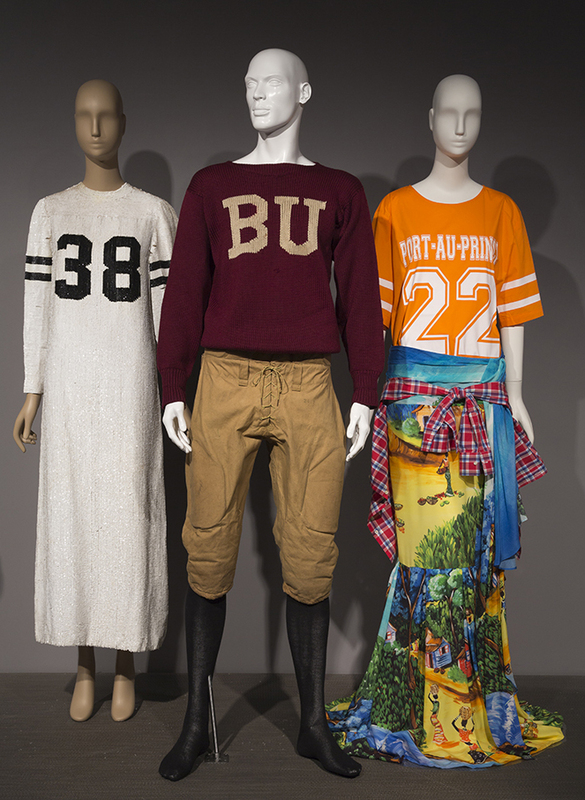 Fashion scholar Rosie Findlay reviewed the exhibit for Address. 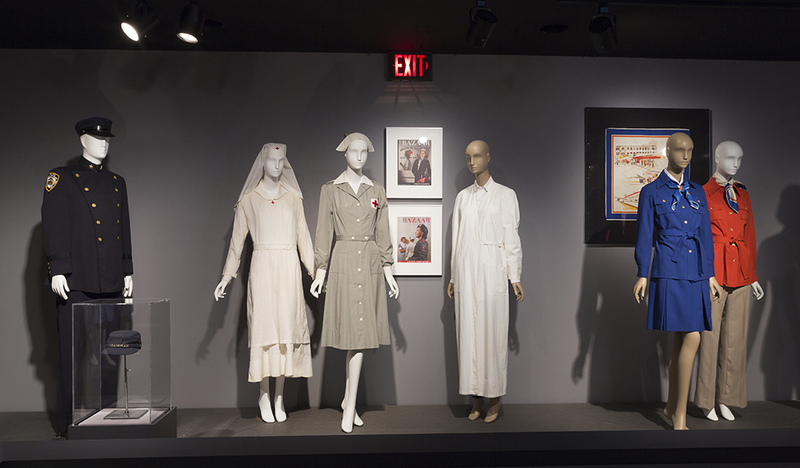 In Uniformity, its current exhibition, the Museum at FIT in New York has created a space for visitors to contemplate the aesthetic significance of uniforms, both in and of themselves and as an ubiquitous influence on fashion designers. This display could have been three times bigger in size, given the wealth of material that could be drawn from, but what curator Emma McClendon has collated acts as a cohesive and comprehensive tasting plate, touching on four categories of uniforms: military, work, school, and sporting. That said, the first ‘uniforms’ visitors encounter don’t fit neatly into any of these categories: a screen by the entrance to the gallery plays on loop a video of New York–based fashion designer Thom Browne’s Autumn Winter 2009 menswear presentation, as shown at Pitti Uomo trade show in Florence. Rows of slim men in Browne’s signature shrunken grey flannel suits sit and type at individual desks, like so many serious schoolboys or office workers— which is appropriate, given that the cut of these suits deliberately draws influence from the apparel of these two groups. From time to time, one man walks to the desk of a teacher/overseer, who also wears a suit and sits facing the others. A bell rings and all stand and file out in simple choreography, each placing an apple on ‘teacher’s’ desk before they leave. Here, we see fashion’s flirtation with uniformity realised, the homogeneity of the models calling attention to the neatness of their suits and evoking its dual influences: the severity of schoolboy uniforms that overwrite youth with structure and the individuality-effacing suits men don that accentuate a set of characteristics they symbolically represent: seriousness of purpose, capability, focus. Of course, when fashion embraces an aesthetic, it usually discards its original meaning, as is evident on display in the gallery: witness the Sacai dress from Spring Summer 2015 that incorporates the navy and white stripe of the marinière with wide white lace, or Geoffrey Beene’s iconic ‘football jersey’ dress that replaces the letters of the home team, arbitrarily it seems, with the number 38. Unlike the originals displayed nearby, which directly communicate specific identity through formalised and functional aesthetics, these clothes simply aestheticise. 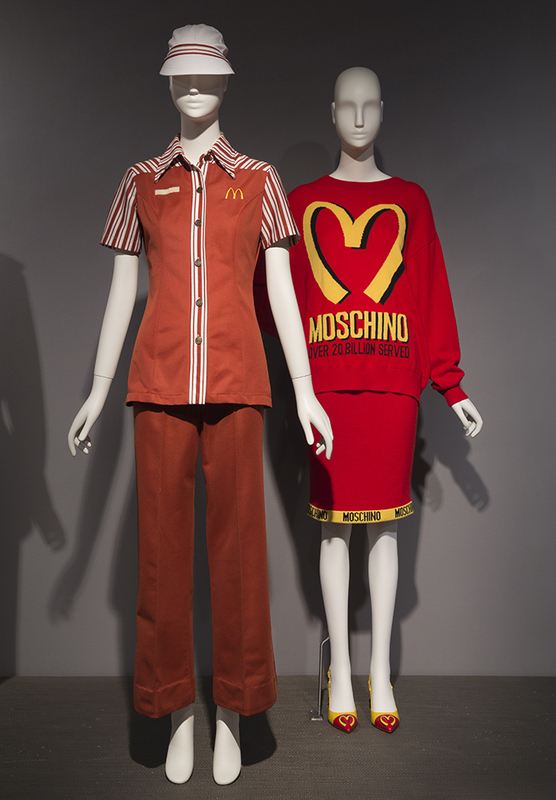 Of course, at times this distinction blurs, as in the display featuring a McDonald’s worker uniform from the 1970s, with its red and white candy-striped shoulders and neat golden arches embroidered over the left breast, arranged beside a playful look from Jeremy Scott for Moschino, the corporate golden ‘M’ softened into a cartoonish almost-heart. Both deliberately stamp the wearer with a brand, and it is left to the viewer to decide what the difference in meaning here is. The close relationship between uniforms and fashion is suggested in the arrangement of the mannequins: those in the centre of each display cluster wear actual uniforms whereas those on the periphery wear the garments they inspired. While these connections are interesting to note, more fascinating was the information this carefully researched show included, explaining the provenance of the aesthetics of these uniforms and their social significance. For example, the marinière is said to have been developed so that if a sailor went overboard, he would be clearly visible in the ocean, and nurses’ uniforms, developed in the mid-19th century, drew on elements of maids’ and ecclesiastical (read: nun’s habits) uniforms to signal not just the wearer’s profession but also her modest, middle-class respectability. The exhibition focuses mostly on uniforms from the United States- police, Marines, army – but also includes a representative selection from other nations, such as Japanese schoolgirl uniforms, the ‘bum-freezer’ uniform of an Eton primary schoolboy, and a Scottish Black Watch uniform from the early 20th century. 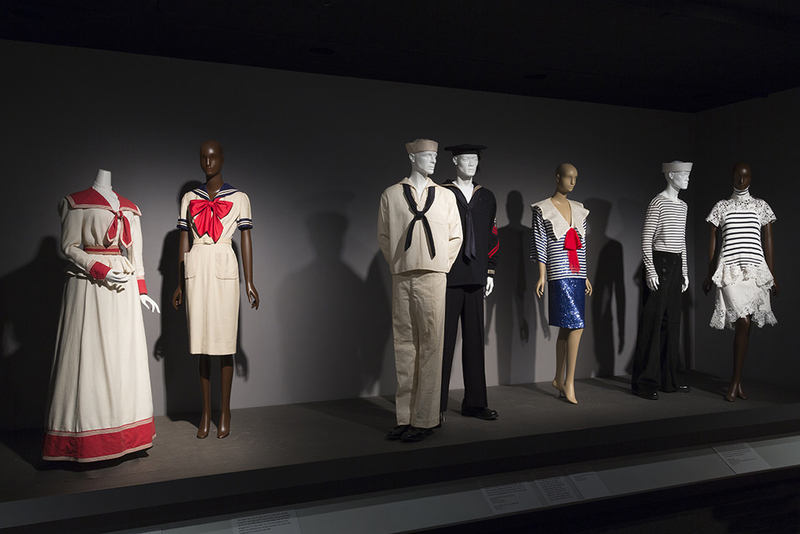 The international provenance of the fashion garments reflects the widespread influence of uniforms on designers, with work by American designers such as Tom Ford, Ralph Lauren and Thom Browne shown alongside looks from Chanel, Stella Jean, Comme des Garçons and Jean Paul Gaultier. Fashion critic Suzy Menkes is cited in the exhibition guide, saying that ‘the way that people dress makes them part of an army, dressed in their own uniform’, but this exhibition pushes further than this easy conflation of uniform and everyday dress. The connotations uniforms afford— hyper-masculinity, say, or the tensile ever-readiness of the sporting body— translate into looks that speak these connotations symbolically, not literally, allowing for the kind of flexible playfulness that uniforms, for all of their striking qualities, do not. Its wide scope makes this an ambitious exhibition, but one that is thought-provoking, educative and well-executed.